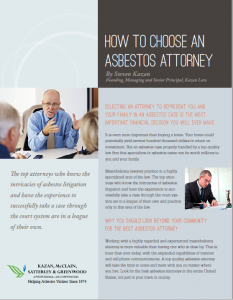 In September 2009 at the age of 44, Timothy Vest was diagnosed with mesothelioma. He and his wife Caroline had three young children together at the time of his diagnosis. Mr. Vest is a highly skilled airline pilot for a major carrier. His exposure to asbestos came as a result of his love of flying. His father was a senior pilot and later executive for World Airways. Young Tim often went with his father to the World Airways hanger at the Oakland Airport on the weekends so he could see the planes being repaired. The hangar, which was one of the largest in the country at the time, was first opened in 1973. Tim visited the hangar twice during construction, when he was exposed to the asbestos-containing fireproofing being sprayed. During the trips to the hangar after it opened, Mr. Vest breathed asbestos dust from the fireproofing in the hangar, from asbestos parts and epoxy on the planes, and from the asbestos drywall products used in the office spaces. Neither Vest knew they were being exposed to this invisible toxin.